Mom-ism Monday #4 is a Dad-ism. My Dad enjoys the somewhat lost art of trading. He also likes to find items at a bargain, repair them and sell for a profit, especially tractors! He can salvage a tractor that looks like it's ready for the scrap metal pile better than anyone I know. He's always looking for a deal. I'm a lot like him. I love to try to find deals and turn a quick buck. He's much better at it than me. He's got way more experience. He's fine-tuned his art over the last 76 years! 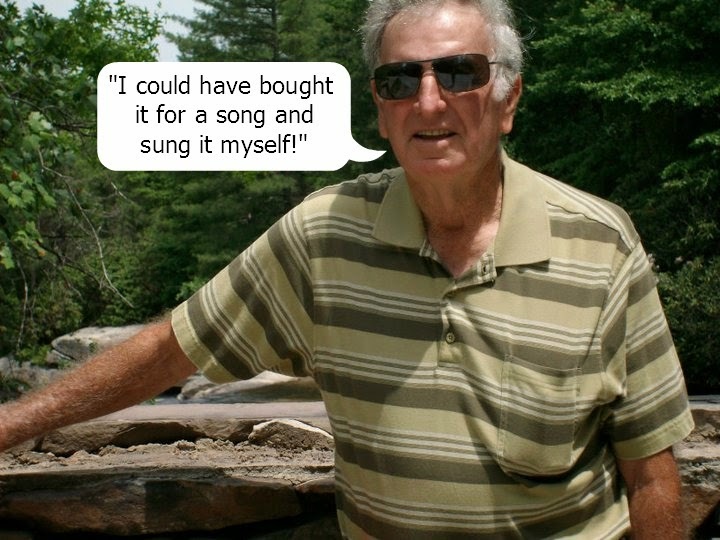 "I could have bought it for a song and sung it myself" is a Dad-ism I had never heard. Have you? The philosophy in the phrase astounds me. How much easier could it get to buy something for a song you can sing yourself? I have put the phrase to work in my vocabulary arsenal already! Leave me a comment with how the phrase speaks to you and if you've ever heard it. I never hear that before. Me either Shirlene but it's definitely a keeper!